/ Overnight Backpacking Checklist [PDF & Infographic] | Most Important Gear and Tips! Do you love to go backpacking as much as I do? I love exploring the great outdoors with friends. There is nothing quite like the self-sufficiency and natural beauty you experience when you are away from the city. Want The 1- Page Backpacking Checklist PDF? However, there is one big problem I always have. I never know what to pack or prepare for and always seem to leave something important at home.​ I'm often scrambling trying to figure out what to pack and whether or not something will travel on a plane. That's why I created this infographic. It is to help you (and me) with a visual representation of everything you should bring on a backpacking adventure. We have included some helpful tips at the bottom to make sure it is a smashing success. Ready to backpack into the unknown? Below you will find a list of the most important backpacking travel items to take with you along with the top tips for backpacking like a pro. If you are anything like me you are always wondering how to pack before you go on each backpacking trip. I am always scrambling, looking on the internet and wondering if I am forgetting something. Google Maps Application - Whether you are on an IOS or an Android device, make sure you have Google Maps installed. Trust me, if you get lost, it will come in handy. Pirates had maps, you have your cellphone. Sunscreen - Take sunscreen, lip balm, and sunglasses with you. Backpackers walk a lot and you don't want to ruin your pretty skin due to excessive sun exposure. Portable Charger - Want to capture the best moments? Bring along a lightweight portable charger to keep your phone on during the long journey. You never know if you'll need it for an emergency. First Aid Kit - Try to have a small first aid kit with you. It's always better to be safe than sorry! Flashlight - Keep a flashlight with you. A flashlight makes evening cooking and settling in at night a lot more enjoyable. Finally, it helps during late night trips to the bathroom. Food/Snacks - Make sure to bring lots of lightweight nutritional foods and snacks like ramen noodles, trail mix, canned tuna, and beef jerky. Stick with lightweight high-calorie items! Water - Dehydration is deadly and you don't want it to happen to you. It's important to keep more water than you think you'll need. Small water purifying devices come in handy as well! Tent or Hammock - Bring a lightweight tent or hammock so you can have a place to lay your head at night. Backpacking Stove & Spork - Get a small portable stove like a Bunsen Burner or canister stove. These will come in handy when cooking your ramen noodles in the wilderness. Special Note: There is no end to this list. Depending on where you are visiting you might have to take more items. These are the essentials, don't forget them! Hostel, Not Hotel - Backpackers should not stay in a hotel. Go for hostels! They are not only cheaper, but you will also meet other like minded backpackers to swap stories with. Keep Extra Cash In A Safe Place - Always remember to keep extra cash in a safe place in case of emergencies. This is especially true when traveling abroad as often times you must pay unexpected tourist taxes like park entrances and Visa fees. Avoid Tourist Traps - Every country has tourist traps. Read about them before you travel and if you are confident in what to expect, being conned becomes much less likely to happen to you. Buy Passes - Don't buy train or bus tickets each time you need one. Save money and go for weekly or monthly passes! They'll save you money and you won't have the hassle of buying new tickets each day. Take public transportation when available. One Backpack Is Enough - There's a reason it's called backpacking. Don't take more than you need and pack lightly. One sturdy backpack with lots of zippers and pockets should get the job done. Camp Out - Save money and camp outside whenever possible. Take a sleeping bag and you will be just fine in the wilderness. Obviously, make sure to know about your surroundings before plopping down for the night. Start Thinking About Your Next Trip on the Ride Home - Put it on your calendar and plan out your next outdoor excursion on the way home. There is always more to explore! 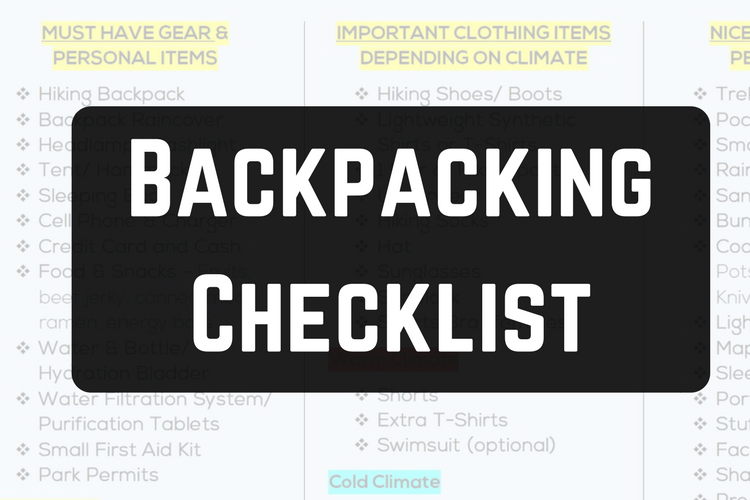 We hope you found our backpacking essentials checklist useful. It's important to have a durable, comfortable backpacking bag to take with you every time you go out. In case you are on the market for a new backp﻿acking backpack we put together an i﻿﻿n-depth guide right here. If you want to put together your own DIY backpacking gear, we recommend you check out our lightweight backpacking equipment article and lightweight hiking backpacks in case you need to pick up some high-quality gear before heading out. Ultimately, our list of backpacking must haves has probably fallen short somewhere. Let us know what backpacking essentials we should add to our next updated list. Subscribe to our Email Newsletter and Get the 1-Page Backpacking Checklist Sent Direct To Your Inbox. We Hate Spam! Your Privacy Is Protected.